Where once scorned or appreciated only after being sautéed in butter, fungi have finally come into their own. If you’re among those who isn’t awed by fungi except when they’re sautéed, swallow this: each gram of soil (the weight of a paper clip) might house over a million fungi, or anywhere from 10 to 100 pounds of them in the top 6 inches of a 1000 square feet of soil. And most of what they do — for plants and soil, forget about your taste buds for now — is beneficial. I recently heard of a project using fungi as a building material. On exhibit at the Metropolitan Museum of Art’s PS1 in New York City is Hy-Fi, a cylindrical tower built our of bricks made from fungi that have been fed cornstalks, the fungi’s fine, thread-like hyphae growing to create dense bricks. An organically grown building! Among the benefits touted were that a building made of fungi could be recycled. I’m not so sure that a building that can be recycled is a good thing, but one statement by the architect did raise my hackles: that the building could be made of waste materials, such as cornstalks. The same argument could be or has been used for ethanol production, which could be made from the same waste material. Corn stalks might be waste material in the sense that we don’t eat them, perhaps not even always feed them to animals. But corn stalks, wheat straw, and other so-called “waste materials,” as the architect perhaps inadvertently pointed out, are a gourmet delight for fungi. Also good food for bacteria (3 million to 500 million per gram of soil), actinomycetes (1 million to 20 million per gram of soil), as well as protozoa, nematodes, and other soil creatures. And don’t forget about earthworms (2 to 22 pounds per 1000 square feet of ground). There’s a lot of hungry creatures down there. So these materials are not waste; they are food for soil life. They are what put the “organic” in organic gardening and farming. (They are “organic” in the sense that they were once living, and that they contain carbon compounds, mostly combined with hydrogen and oxygen.) They confer a range of physical, nutritional, and biological benefits to soil, plants, and, hence the animals, including humans, that feed on them. Depriving the soil of these organic materials is what led, in part, to the dust bowls of the 1930s. Corn stalks as well as other organic materials too often considered as waste should be returned to the soil, either directly or after being first run through a compost pile. One measure of soil quality is the amount of organic material it contains. Japanese beetles have not come into their own; they have never been and continue to NOT be appreciated. The swarmed in a few weeks ago to make lace of the foliage of a whole host of plants. Grapes are among their favorites, evident by merely looking out on the landscape and picking out the hole-y grape leaves. (The leaf veins typically remain intact.) Although roses are also a reputed favorite, the beetles left mine unscathed. 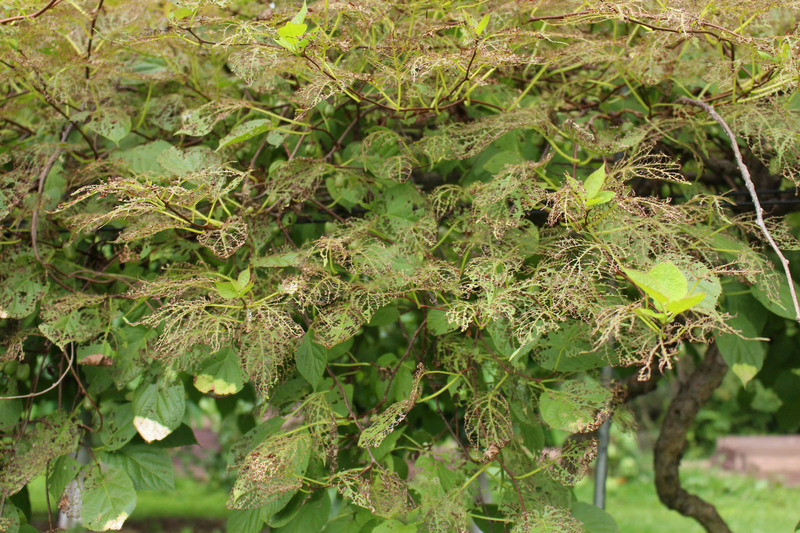 Most interesting is the beetle’s effect on my hardy kiwifruits, specifically the super-hardy sorts (Actinidia kolomikta). I have four plants, 3 females — Krupnoplodnaya, Aromatanya, and Sentayabraskaya — and one male. 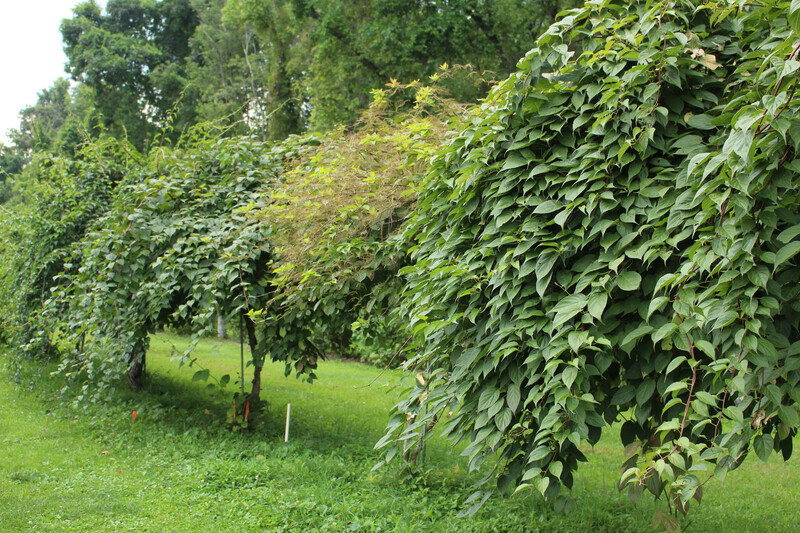 Of all those plants, only the Sentayabraskaya plant was attractive to the Japanese beetles, dramatically so. Looking up, I can see sky through almost every leaf. Japanese beetles are hard to keep in check. For a few plants, hand picking into a can of soapy water (the soap so they don’t just fly out after a quick bath) is effective. The biological insecticide milky spore disease, applied to lawns to kill the grub stage in the soil, is sometimes effective, especially in more southerly locations. Of course, beetles emerging from the soil in summer can fly, so milky spore is useless unless done on a neighborhood scale. Neem is a relatively benign repellant and insecticide that’s somewhat effective sometimes; it would require too much spraying, especially for something with such an iffy effect. So I just wait the beetles out. Plants can tolerate a certain amount of damage and the beetles typically wave goodbye to go burrow into the soil and lay eggs sometime in August. The wait was especially short this year, with most of the beetles departing by the third week in July. Thank you guys, and gals. And Where Did Mexican Bean Beetles Go? appetites, stripping leaves from tomato plants in the matter of hours, turned up in a friend’s garden. Fortunately, piggybacking those beetles were what looked like grains of rice. They’re actually cocoons of a braconid wasp, which will kill the hornworm. 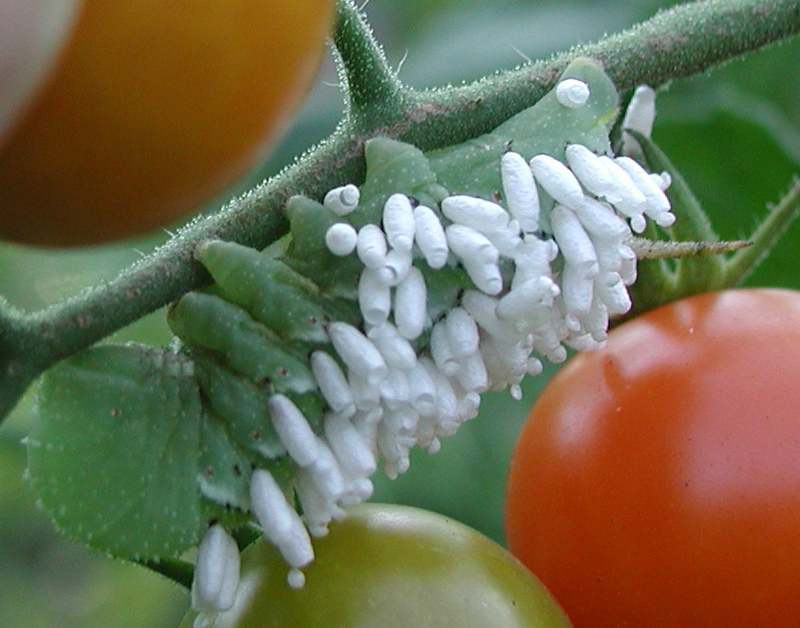 Leaving parasitized beetles alone lets the parasite live to attack more hornworms. Parasite attacks tomato hornworm; winner: parasite. 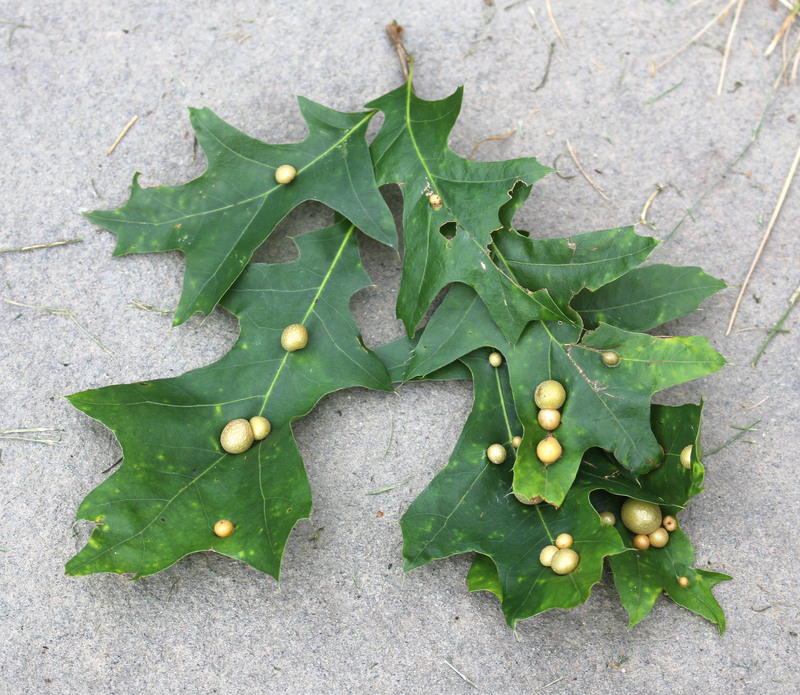 Also worth ignoring are the pimples that have been appearing on leaves of many pin oaks. Those pimples — hemispheres about 1/2” across — are galls. Plant galls are abnormal growth made in response to an irritant such as a bacteria, a fungus, or, most commonly, an insect. A few galls here and there rarely do a plant harm. Those oak leaf galls are pocking almost all the leaves on my pin oak. Still, I’ll ignore them or admire them; they sort of liven up the look of the tree. It’s too late, anyway, to do anything about them. This entry was posted in Gardening, Pests, Soil, Vegetables. Bookmark the permalink. Trackbacks are closed, but you can post a comment. Is not the hornworm adult a sphinx moth, not a beetle? Yes, the adult hornworm is a sphinx moth. Fascinating! I am very intrigued by a house of fungi. I am saving stalks and stems that are hollow to build a bug hotel – I love to learn about all the insects in my garden. I rarely see a Japanese Beetle in my garden but do see them at TI Park where I work. I can’t tell you why I don’t seem to have them in my own garden. I don’t have Mexican Bean Beetles either but my beans are lacking. I don’t have butterflies either this year but I do have lots of bees and lots of birds. I wonder if a garden shed made of fungi would feed the garden around it? So interesting the possibilities. A large benefit of fungi is the work they do in the ground, not in structures that we build. My approach is to keep feeding my soil and compost pile with an abundance of fungal foods, that is, organic materials. Of course, it would be wrong to over emphasize fungi. Bacteria, actinomycetes, earthworms, and myriad other creatures play their roles in a healthy garden, farmden, or farm. So we should leave the little patches that look like clusters of white rice? Definitely!!! Leave the insect and its parasite alone. This was so interesting. Thank you for all the information. Thanks for your generally “watch and appreciate” perspective on potential pest problems. A lot better than mindless spraying.